"Just as man cannot live without dreams, he cannot live without hope. If dreams reflect the past, hope summons the future." Elie Wiesel "Hope, Despair, and Memory"
"Hope is a good thing — maybe the best of things. And no good thing ever dies." "You can either have an hour of hope or an hour of despair." "Traditionalists are pessimists about the future and optimists about the past." "The future belongs to those who give the next generation reason for hope." "The point of living and of being an optimist, is to be foolish enough to believe the best is yet to come." "Some see the glass as half-empty, some see the glass as half-full. I see the glass as too big." "Hope is our life anesthesia." "Clear sky is bigger than the largest rain clouds." "Gratitude is merely the secret hope of further favors." "Optimist (n) - A person who spends the last dollar to buy a new wallet." "Pessimist: One who complains about the noise when opporuntiy knocks." "Even optimists have a 100% mortality rate." "A laugh is a smile with a soundtrack." Vaclav Havel "Disturbing the Peace"
"Hope is a pathological belief in the occurrence of the impossible." "An optimist invented an airplane, a pessimist invented a parachute." "Optimism is the content of small men in high places." "The grand essentials of happiness are: something to do, something to love, and something to hope for." "You are as young as your faith, as old as your doubt; as young as your self-confidence, as old as your fear; as young as your hope, as old as your despair." Elias Canetti "The Secret Heart Of The Clock"
"We should not moor a ship with one anchor, or our life with one hope." "Hope is tomorrow's veneer over today's disappointment." "Hope is the only universal liar who never loses his reputation for veracity." "Optimism is the madness of insisting that all is well when we are miserable." "The present is the ever moving shadow that divides yesterday from tomorrow. In that lies hope." Frank Lloyd Wright "The Living City"
"A desert is a place without expectation." "I'm a pessimist because of intelligence, but an optimist because of will." Antonio Gramsci "Gramsci: Letters from Prison"
"Pessimists are the people who have no hope for themselves or for others. Pessimists are also people who think the human race is beneath their notice, that they're better than other human beings." "I am an anarchist in politics and an impressionist in art as well as a symbolist in literature. Not that I understand what these terms mean, but I take them to be all merely synonyms of pessimist." "Uncertainty is the refuge of hope." "Take hope from the heart of man and you make him a beast of prey." Ouida (Marie Louise De La Ramée) "Wisdom, Wit and Pathos"
"A man may be a pessimistic determinist before lunch and an optimistic believer in the will's freedom after it." 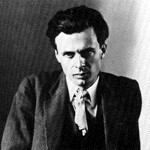 Aldous Huxley "Do What You Will"
"Hope is like a harebell trembling from its birth." "It's such an act of optimism to get through a day and enjoy it and laugh and do all that without thinking about death. What spirit human beings have!" "I believe in the sun even if it isn't shining. I believe in love even when I am alone. I believe in God even when He is silent."